Rev. Ebenezer Kellogg came to North Bolton, the future Vernon, in 1763 to become the first minister at the new North Bolton Meetinghouse. During his 55-year tenure he guided the new parish as it grew into a town and saw the transformation of the agricultural community to an industrial community. Many of his sons and grandsons remained in Vernon and played significant roles in its growth during the Nineteenth Century. This page is an overview of the early Vernon Kelloggs and their contributions to our town. For some of the family members there are links to more expansive biographies. The Kellogg family traces its ancestry to England and Nicholas Kellogg in 1486. Daniel Kellogg (1630-1688) was the first of our Ebenezer's ancestors to come to America, although not the first Kellogg in Connecticut. He likely came with his brother Joseph and was one of the early settlers of Norwalk, CT emigrating from Great Leighs in England. It is not known just when he arrived but his name appears on town lists by 1656 when he would have been only 26. It is said he was he largest man of the pioneers, being more than seven feet tall and of proportiante dimensions otherwise. He was considered muscular and athletic. He is said to have intervened when two Indians were hassling a white man in his abode, rubbed their heads vigorously together and taught them a lesson. He was active throughout his life in town affairs as a selectman and representative to the General Court. He had nine children with Daniel his oldest son. Daniel Kellogg (1671-1710) was a farmer in Norwalk, CT. Not much is known about Ebenezer's grandfather. He had 5 children and apparently died before he was 40. He had five children. His estate was about 500 pounds and distributed to his five children such that his wife might have died in childbirth when his last son was born shortly before he died. Daniel Kellogg, Ebenezer's father was born in Norwalk, CT in 1698. He was his father Daniel's oldest son and only 12 when his father died. He likely inherited his father's farm and helped raise his brothers and sisters. At his death in 1762 at age 64 his estate was appraised at more than 600 pounds, a reasonable amount for the time. He and his wife Eunice Jarvis had 8 children, including our Ebenezer. Our Ebenezer was born in Norwalk and graduated from Yale College in 1757. He came to Vernon in 1762 to serve as minister of the newly raised Meetinghouse in the newly formed North Bolton parish. He would serve as minister for 55 years and guide the town during this formative period. He married Hannah Wright in Stamford, CT in 1763. As was the custom of the time he was given a farm near the Meetinghouse. They had six children, three boys and three girls. 1766 Daniel m. Susanna Griggs of Tolland. He was a goldsmith and clockmaker settlig in Tolland, where he was also Town Clerk. He later moved to Colchester and then Hartford. He had 12 children but none returned to Vernon. 1768 Hannah m. Phineas Talcott, son of Deacon Benjamin Talcott of Bolton. Phineas was a farmer in Vernon, active in town affairs and rrepresented Vernon in the Legislature as well as the Cnstitutinal Convention in 1818. IN addition he was a Justice of the Peace and a Deacon. Their son Phineas was superintendent of schools in Hartford, then at the Insane Asylum before returning to Vernon where he was active in town affairs and manufacturing. 1773 Eunice m. Dr. Scottoway Hinkley of Hardwick, MA who was a physician and manufacturer in Vernon. 1781 Elizabeth died at age 2. The Kelloggs were buried in the Old North Bolton Cemetery on Bamforth Road near their farm, but reintered in the Maxwell plot at Grove Hill in ??? by ???? More detailed biography of Rev. Ebenezer Kellogg. Ebenezer Kellogg, Jr., son of Rev. Ebenezer was born in Vernon on October 21, 1764 shortly after his parents married and moved here. He would have been raised on the family farm located near the meetinghouse and the church would have been an integral part of his life. Ebenezer had three wives. He first married Abigail Olmsted, daughter of Nathaniel Olmsted of East Hartford in 1789 who was 6 years older than he was. She died just 8 years later in 1797. He next married Hannah Olmsted, daughter of Ashbel Olmsted of East Hartford, likely a cousin of his first wife, in 1801. She died a year later in 1802, a week after she gave birth to twin girls who died. He then married Elizabeth Sheldon, daughter of Ephraim Sheldon of Somers in 1780. Ebenezer, Jr. was a farmer but as most landholders at the time was active in town affairs holding the town offices of Constable and Justice of the peace and he twice represented his town in the Legislature. He died at age 48 in 1812 of typhus fever, predeceasing his father. Elizabeth then married Deacon Alexander McLean, outlived him and died in 1867. Ebenezer, Jr was buried in the family plots in the North Bolton Cemetery and later in Grove Hill. He died the same year his last daughter was born. The family added land to its holdings as the family grew. Ebenezer, Jr had the farm and likely the Allis House property at ??? Corners. Ebenezer Jr had 12 children with his three wives, 7 sons and 5 daughters. Five died in infancy. The four sons who survived made significant contributions in the community, acedemia, and birth of industrial Vernon. 1789 Ebenezer graduated from Yale College in 1810 and Andover Theological Seminary in 1815. He m. Susan Coit of New London in 1826. He had a prominent career in acedemia at Williams College and left no children. 1791 Martin was drafted into the army and died of camp fever in New London in 1814. 1794 Allyn m. Eliza White and was a local farmer, churchman and historian. 1796 Nathaniel Olmsted m. Eliza Nash and became an industrialist founding Kelloggsville. More detailed biography of Rev. N. O. Kellogg. 1804 Sheldon died at age 2. 1807 Elizabeth m. George Morgan of Plainfield. 1810 A daughter died at birth. 1811 A son died at birth. 1812 Abigail Olmstead m. Samuel Poldore Rose. Thomas Wright Kellogg, son of Rev. Ebenezer was born in Vernon on June 24, 1770. He too would have been raised on the family farm located near the meetinghouse and the church would have been an integral part of his life. He married in 1795 Mary Hubbard of Glastonbury, daughter of Aaron Hubbard. He lived on the family homested,held varous town offices and was Justice of the Peace. When he set ot for his bride, he rode one horse and led anther on which she retrned. The journey of forty miles to Glastonbury was made in a single day, and they returned in the same time. No honeymoons in those days. 1797 Henry m. Elethea Birge was a farmer and moved family to Freedom, Ohio in 1840. 1800 Hubbard m. Julia Selden, daughter of Deacon Hezekiah Selden in 1835. He was a farmer owning property on Bamforth and Baker Roads. His home is still on Baker. He died in Norfolk and had no children. 1800 Hudson was a twin to Hubbard. He m. Jane Davis of Thorold Canada where he was a lumber dealer. Later lived in Antigo, WI where he died in 1885. They had 11 children born in St. Johns, Canada, Manhattea and the last two sons in Vernon. Hudson Hiram, 1842, lived in Rockville and was a dealer in wool, but had no children. Aaron Hubbard, 1844, was born here and married Mary Frances Sanford. 1807 Hannah Wright m. Deacon Joseph Cove. George Kellogg, son of Ebenezer, Jr was born in Vernon on March 3, 1793. He married Eliza Noble of Middletown on January 1, 1817. In 1821 he joined Col. Francis McLean and others in building one of the first woolen mills, chartered in 1828 as the 'Rock Manufacturing Company'. He was the agent of the company until 1837, and again from 1846 untill his death. In 1837 he assisted in establishing the mill of the 'New England Company' in Rockville, and was its agent until 1846. In 1857 and 1865 he represented Vernon in the Legislature, and in 1866 was a member of the State Senate. He assisted in establishing the first and second churches in Rockville, in both of which he was deacon. In 1855 he was elected a corporate member of the American Board of Commissioners for Foreign Missions, which position he held till the close of his life. He died on August 8, 1870 at age 77. He and his wife were buried in Elm Hill Cemetery until reinterred by his daughter Harriet in Grove Hill Cemetery. 1817 Ebenezer Noble m. Lydia Billings. 1821 Eliza died at age 15. 1824 Harriet m. George Maxwell. 1828 George m. Sarah Colton. 1838 Edward m. Emily Kingsbury. Allyn Kellogg, son of Ebenezer, Jr was born in Vernon on August 17, 1794. He was a farmer residing on his father's homestead. For nearly 50 years he was a deacon in the First Congregatinal Church inVernon and represent that town in the Legislatue in 1862. He iss described as a Christian gentleman with all the dignity and courtly manner of a gentleman of he eighteenth century. We have Allyn to thank for our knowledge of the Old Meetinghouse and early days of the church and town. In 1888 he was requested to address the church and his comments were published in "The Church of Christ In Vernon, Connecticut: An Historical Address." Have spent his youth in the old Meetinghouse as the grandson of Rev. Ebenezer he was the perfect person to describe the early days. Also at his death a survey was made of his farm that has survived. He apparently acquired the farms of his father and grandfather and the map reflects dates and previous family ownership. Allyn married Eliza White of Andover on January 9, 1822. He died on September 11, 1873 and he and is wife are buried in Elm Hill Cemetery. 1824 Aaron Stanley married Maria Lauriana Avery. 1828 Martin married Lousa Wells Brockway. 1832 Daughter died at birth. 1832 Twin Daughter died a week later. As was the tradition of the time when Rev. Ebenezer Kellogg was hired for the new Meetinghouse he was given property for a farm as it was expected he would raise his own food. It is likely that his home was the Allis house, still in use, at the corner of Hartford Turnpike and South Street. As his family expanded they acquired nearby farms and Rev. Ebenezer's children and grandchildren inherited, bought or were given land for their own farms and houses. The location of many of the home are shown on the 1853, 1857 and 1869 Vernon maps, but they don't show the extent of their property. 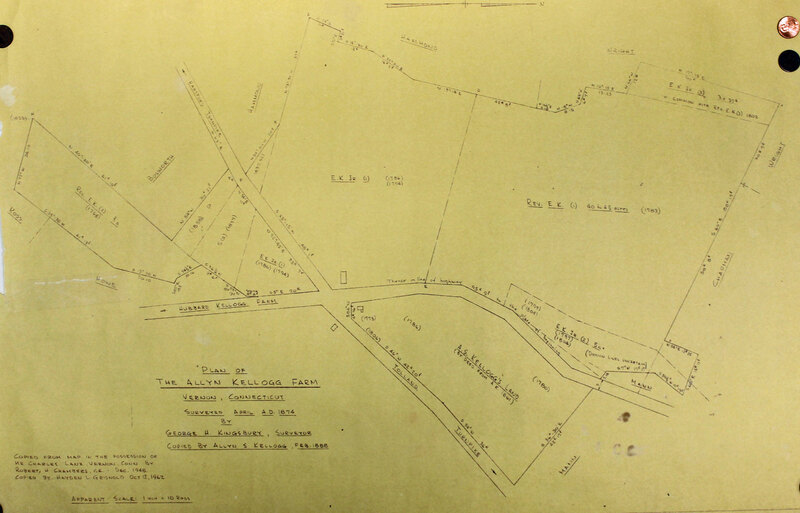 Just after the death of Allyn Kellogg in 1874 a survey map was made of Allyn's farm that also shows parcels previously owned by his father and grandfather with dates he acquired them. The family owned most of the land around the Lanz corner intersection down to the Bamforth Road burying ground. When the Interstate was built around 1940 it cut thorough the heart the Kellogg farms so it is hard to get a feel for what the land looked like a century ago. An exploration of land records will better define the size of their farms. Early deeds of the ??? family mention a cranberry bog owned by George Kellogg. This is the only documented instance of raising cranberrys in Vernon. There are remnants of wetlands north of I-84 and the highway likely took this part of the farm. Traditionally a person's final resting place is where they were upon death. However for the early Kellogg's their initial resting place was only temporary. The early Kellogg's are buried in three of Vernon's cemeteries - The Old North Bolton Burying Ground, Elm Hill and Grove Hill. Old North Bolton Burying Ground - For over a hundred years the Kellogg family farms were grouped around the intersection of Hartford Turnpike and Bamforth Road/South Street extending to near this cemetery on Bamforth Road. The cemetery began in 1751, about 10 years before the Meetinghouse was built and Rev. Ebenezer Kellogg was called to preach there. Indeed the location of the cemetery, the only one in North Bolton at the time was probably a factor in determining the location of the Meetinghouse. Many of our earliest settlers were buried there. The early Kellogg men and their families buried there were Rev. Ebenezer, Ebenezer, Jr., ????? Elm Hill - The Old North Bolton Burying Ground was closed in 1851. When the Congregational Church moved down the hill to Vernon Center in 1824? it made sense for a cemetery closer to the church and the center of the community in addition to needing more space for the growing community. By the third generation, Rev. Ebenezer's grandchildren, the family was being buried there in two large plots near the cemetery's entrance. Family members buried at Elm Hill include Allyn, George, Thomas, Nathaniel O., ????? Grove Hill - As Rockville grew and became prosperous Grove Hill became residents cemetery of choice. Wealthy mill owners had grand memorials, crypts and family plots. But Rev. Ebenezer's great granddaughter wanted more. ??? Maxwell took a plot of land adjacent to but separate from the primary cemetery for her family. It's a lovely area overlooking Paper Mill Pond on its own little stream. With her money and influence she had her ancestors exhumed from their initial resting places and brought to the Maxwell family plot. In most cases this included their gravestones. In their place are flat slabs noting who was initially buried there and that they had been reinterred elsewhere. Early Kellogg's and spouses now at Grove Hill include Rev. Ebenezer, Ebenezer, Jr and George. 1874 Plan Of the Allyn Kellogg Farm. Copy at Vernon Historical Society. Hopkins, Timothy (1903). The Kelloggs In The Old World and The New, Volume 1. Most of the information on this page is extracted from this 3 volume Kellogg genealogy. It is available online.